Gareth McAuley and Romelu Lukaku scored late goals as West Brom pinched a remarkable victory at Liverpool to end a sequence of six games without a win. The away side, managed by former Reds assistant boss Steve Clarke, weathered sustained pressure, including a superb penalty save from Ben Foster to deny Steven Gerrard after 77 minutes. That seemed to inspire Clarke's team, who went close from fit-again midfielder Youssouf Mulumbu before McAuley headed in Chris Brunt's corner nine minutes from the end. Worse was to come for the hosts on a frustrating and freezing night at Anfield as substitute Lukaku broke forward, glided past Daniel Agger and shot beyond Pepe Reina. The result not only ended the Baggies poor run but also lifted them a point above Liverpool into eighth in the Premier League table. Defeat for Brendan Rodgers's team was their first in four games at Anfield and came when it looked like his side were beginning to build momentum after encouraging draws against Arsenal and Manchester City. The result perhaps underlined the importance of injured striker Daniel Sturridge, who has scored four goals in six appearances since joining Liverpool in January. His absence meant Luis Suarez played in a lone striker role, and the Uruguayan at times was unable to burst into the box to finish moves that he had helped to create. Jonjo Shelvey, in the side instead of Sturridge, had the ball in the net but his effort was correctly ruled out for offside, while Gerrard and Stewart Downing tested the excellent Foster with long-range shots. But Liverpool came closest to scoring before the break via West Brom's Steven Reid, who almost put the ball into his own net under no pressure at all following Shelvey's cross. Rodgers's side upped the tempo after the interval as the home support grew increasingly frustrated and Liverpool were almost rewarded but Foster stopped Jordan Henderson's backheeled effort after a flowing move. At the hour mark, it appeared as if West Brom were happy to stick with what they had. They continued to get men behind the ball and were in no rush to get the game going again after various re-starts. They still had Foster to thank for a fine save to deny Fabio Borini, after the substitute collected Downing's cute lay-off, and then the Baggies goalkeeper produced a firm hand to stop Gerrard's powerful effort from inside the box. The former England keeper left his best until last, though, when he dived to his left to claw away Gerrard's penalty after Jonas Olsson conceded the spot-kick when he crashed into Luis Suarez. 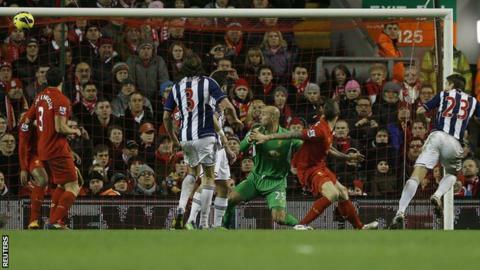 The captain's effort was Liverpool's 19th attempt on goal. West Brom responded immediately with Reina tipping Mulumbu's long-range shot round the post - with what was the visiting team's first effort at goal. But McAuley leapt unmarked to nod in Chris Brunt's delivery from the subsequent corner. Lukaku, who in a bold move had been brought on in place of midfielder Graham Dorrans after 74 minutes, sealed the stunning victory with his stoppage time strike, dealing a further blow to Liverpool's slim hopes of qualifying for next season's Champions League.